Congratulations Middle School MathCounts Team who competed last weekend. Kaleb Stone was 3rd and Josh Glasgow was 6th in individuals out of at least 80 students. 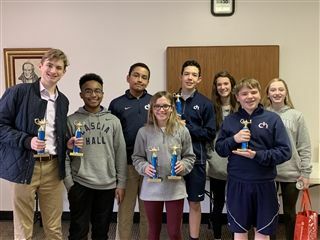 Cascia Hall Team 1 - Ella Newhouse, Josh Glasgow, Kaleb Stone, and Jamison Fisher were tied for first with two other teams but ended up third in tiebreaker rules.